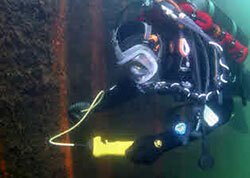 The Multigauge 3000 is an easy-to-use but very sturdy underwater ultrasonic thickness gauge. The underwater ultrasonic thickness gauge has been specifically designed for thickness measurements below the water surface and under extreme environmental conditions. Therefore the underwater ultrasonic thickness gauge can be used worldwide to peform ultrasound thickness measurements in up to 500 m deep water. 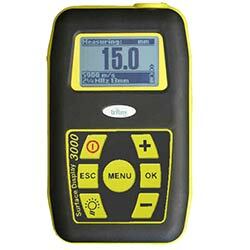 The underwater ultrasonic thickness gauge Multigauge 3000 also owns a large, bright LED display with a good readability, this allows the diver to read the test results even in poor visibility conditions. Thanks to the multiple echo, the ultrasonic thickness gauge allows fast accurate measurements without having to remove layers before. Furthermore, the underwater ultrasonic thickness gauge is equipped with IPR (Intelligent Probe Recognition) and AMVs (Automatic Measurement Verification System). IPR automatically increases the performance in the underwater ultrasonic thickness gauge, AMVs guarantees that only meaningful measurement results are displayed, even on badly corroded metals. The integrated battery of the underwater ultrasonic thickness gauge has a duration of up to 55 hours. Another advantage of the battery is the low load time. 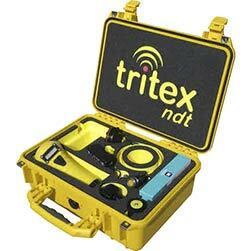 Here you will find an overview of all underwater ultrasonic thickness gauge (s).. If you have further questions about the underwater ultrasonic thickness gauge multigauge 3000, look at the following technical information, read the technical data or get in contact with us: UK customers +44(0) 23 809 870 30 / US customers +1-410-387-7703. Our technicians and engineers will inform you about our underwater ultrasonic thickness gauge (s) or any other product in the field of regulation and control, measuring instruments or scales and balances of PCE Instruments Ltd. Depending on the material to be measured, each multiple echo thickness gauge should be calibrated at different sound velocities. Paints have different sound speeds as metals, it is necessary to ensure that these do not affect the measurements. 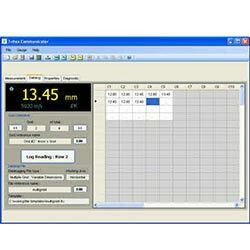 The 3-echo technology guarantees that all coatings have no effect on the measurement. 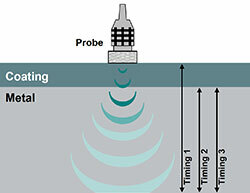 A transmitted ultrasonic pulse is sent through paint and metal and is reflected by the rear wall. The returning echo reverberates in the metal and only a small part of the echo returns through the coating. The time between the small echoes gives us the time of the echo within the metal, this time is in direct connection to the material thickness. The multiple echo thickness gauge interprets the recurring echoes automatically and calculates the thickness of the material. A minimum of three echoes is checked each time. This is called Automatic Measurement Verification System (AMVs). The standard unit makes it possible for the diver to carry out underwater measurements. The large, bright display allows good readability even in poor visibility conditions. 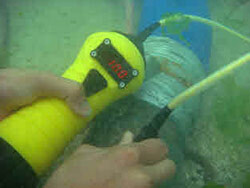 The underwater ultrasonic thickness gauge benefited from the fact that it is very accessible and easy to hold. 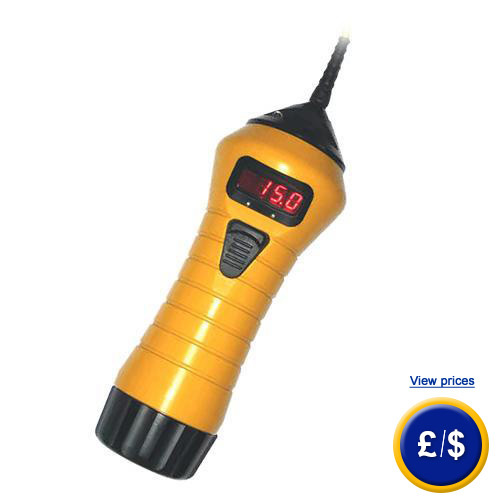 The underwater ultrasonic thickness gauge can be fitted with a pulse stretching, by simply replacing the end head. This extension cable can be up to 1000 m long. The surface display unit of the underwater ultrasonic thickness gauge shows the measurement results of the Multigauge 3000 diving unit. This makes it possible to show the readings above the surface of the water, for example if there is a bad visibility under water or if the measurement results must be verified by a second person. Additionally allows the surface display unit to change the settings of the diving unit, for example calibration, measurement units and resolution. Underwater ultrasonic thickness gauge Multigauge 3000 with integrated battery, Standard 2,25 MHz 13 mm sensor, spare membranes, membrane oil, membrane button, 15 mm test block, replacement O-ring, battery charger, probe-separation aid, carrying case, software, manual.